If this is true then the problem of a reliable source of water on Mars, that is available the entire year, is solved. The question is: How is it possible that none of the American satellites, one of them with a resolution at least 8 times better than Mars Express, have been able to discover this huge reservoir of water? I have not found any NASA document that states the crater in the above image is filled with stable ice. I knew that the american probes discovered temporary carbonic and ordinary snow on the surface of Mars, but not permanent frozen water. 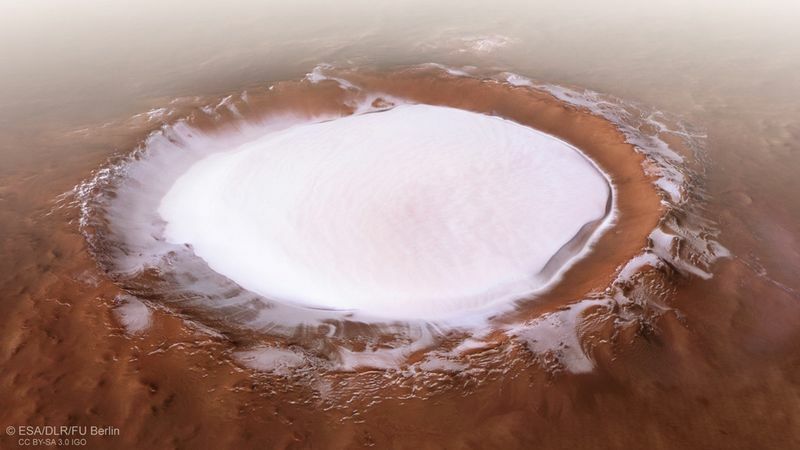 Old NASA pictures showing a crater filled with a white substance do not automatically imply the US space agency discovered permanent surface ice on Mars. The ice-filled Korolev crater appears in Viking imagery taken in the '70s. It took the arrival of suitable radars in orbit (like MARSIS on Mars Express and SHARAD on MRO, ca. 2005-6) to determine the ice's depth and structurea. The question queries the veracity of the (unsourced) assertion that there is "[m]ore water in a crater on Mars1 than the quantity dumped by the river Nile into the Mediterranean sea in 45 years". We can easily check the validity of this claim. The paper in the latter link states that there is "a minimum ice volume of ~1400 km3 contained in Korolev" and a maximum (likely an overestimate) of 3,400 km3. The Nile river discharges at a rate of 2,830 m3/s which is 89.25 km3/year; over 45 years this comes out to 4,016.25 km3 which is way larger. A more accurate estimate would be over 16 years which, coincidentally, nicely matches the duration-to-date of the Mars Express mission. As for the "photo"2 in the question, the article it was taken from3 appears to be partly based on an ESA press release entitled "Mars Express gets festive: A winter wonderland on Mars". The press release (and the image) are dated 2018-12-20, the same day the question was asked, and presumably was the source used by the linked article. In other words, this is not a new discovery but rather ESA having a bit of seasonal fun (and doing some good outreach/education in the process). The North Polar Residual Cap (NPRC) is a surface water ice deposit that persists throughout the martian summer ... Multiple impact craters peripheral to the NPRC contain surface ice with similar appearance, albedo and spectra (Conway et al. 2012; Brown et al. 2008). Korolev crater contains the largest of these deposits and has thermal properties (Armstrong et al. 2005) and underlying layering (Brothers and Holt 2016[a]) that is similar to the NPRC. Generally though you'll find documents meeting your criteria (i.e. with analysis by an author directly employed by NASA) rather scarce since NASA is focused on data collection, not data analysis (which is more the domain of academia). The overwhelming consensus, both NASA-affiliated and not, is that the northern ice sheet is currently permanent with some seasonal variation in size, distribution, and composition. There is an abundance of photographic, spectrographic, and radar data supporting this and no evidence showing that the region is seasonally ice-free. Two craters with permanent ice deposits (Korolev and Louth) lie in areas that, based solely on latitude, should only support perennial ice. At present, scientists are still weighing the evidence on the crater ice's age. Note that Brothers and Holta does not doubt that Korolev crater contains permanent ice rather it goes into the evidence supporting a young (<5Myo) versus old (>5Myo) age for the deposits. Said paper concludes that though the data is somewhat different than expected and is mixed it clearly supports a young age (possibly as little as 4Myo) for the crater ice. It goes on to suggest that despite a probable younger age for the crater ice, "martian polar climate (and paleoclimate) can best be deciphered through a unified study of Planum Boreum and circumpolar ice features." 1 Presumably Korolev since that's what's shown in the photo the questioner provided. 3 Per the attribution given by the questioner. 4 Note that scientific instruments on NASA probes are typically run by university teams and not by NASA. a Brothers, T. C., and J. W. Holt (2016), Three‐dimensional structure and origin of a 1.8 km thick ice dome within Korolev Crater, Mars, Geophys. Res. Lett., 43, 1443–1449, doi:10.1002/2015GL066440. b John C. Armstrong, Timothy N. Titus, Hugh H. Kieffer (2005), Evidence for subsurface water ice in Korolev crater, Mars, Icarus, Volume 174, Issue 2, 360-372, ISSN 0019-1035, doi:10.1016/j.icarus.2004.10.032. 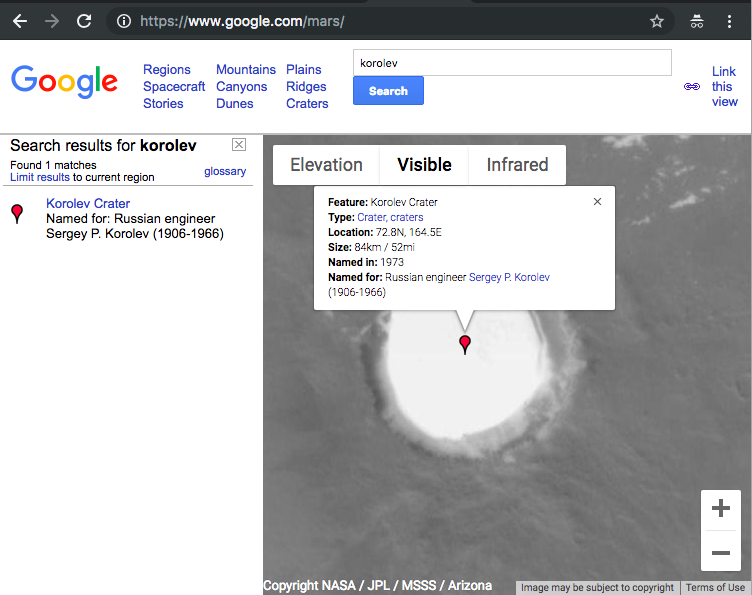 Korolev crater has been sitting there in plain sight for quite a while already. There is no sudden "discovery", just the ESA press office doing it's job. The image itself is a composite of pictures of the crater taken by the Mars Express High Resolution Stereo Camera. The European Space Agency's Mars Express mission is celebrating 15 years after it launched in June 2003 and entered Martian orbit on December 25, 2003. I think the only news here is that this is Mars Express' fifteen year anniversary. Release of this composite image to news organizations is just meant to celebrate that fact. I don't believe there is any scientific news here. Not the answer you're looking for? Browse other questions tagged mars water or ask your own question. Two totally different pictures of Apollo 15 landing site released by NASA 40 years apart. What causes these differences? Are the surfaces in permanent shadow in Moon craters 'fluffy'? 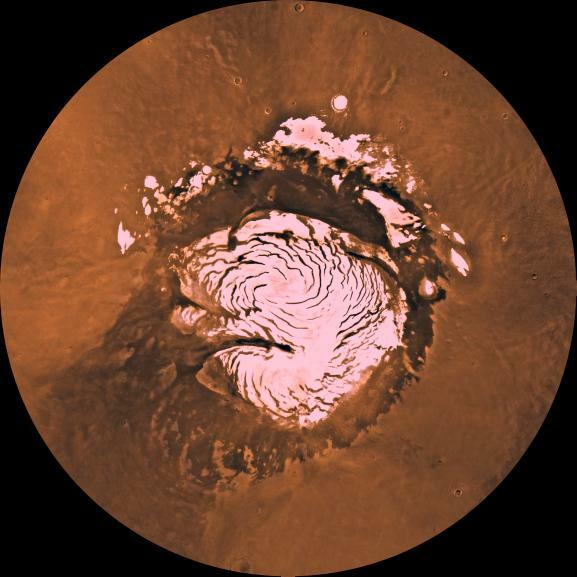 Practical ice deposits on Mars? Is there really a frozen lake near the equator on Mars? What is the most economical way to vaporize the CO₂ deposit near the south pole of Mars?